A warm welcome to new subscribers. Vedic Mathematics is becoming increasingly popular as more and more people are introduced to the beautifully unified and easy Vedic methods. The purpose of this Newsletter is to provide information about developments in education and research and books, articles, courses, talks etc., and also to bring together those working with Vedic Mathematics. If you are working with Vedic Mathematics - teaching it or doing research - please contact us and let us include you and some description of your work in the Newsletter. Perhaps you would like to submit an article for inclusion in a later issue or tell us about a course or talk you will be giving or have given. If you are learning Vedic Maths, let us know how you are getting on and what you think of this system. This issue's article is from Wired Magazine (http://www.wired.com) and is written by Manu Joseph. MUMBAI, India -- What is the square of 85? In an instant, a 17-year-old boy said without blinking, "7,225." Kamlesh Shetty had used a trick from a quaint concept called Vedic math, a compilation of arithmetic shortcuts believed to have been written by ancient Indians who lived centuries before Christ, during a glorious period in Indian history called the Vedic Age. Its math has now crawled into the 21st century to further Shetty's dream of cracking a nasty engineering entrance exam. For most Indian students, engineering is a calling decided in the cradle by their parents. It is engineering that is most likely to take them away from Third World realities to the shores of America's good life. So the tussle to get into engineering colleges is often cruel. In top entrance exams, only one out of 100 candidates makes the cut. Quick problem-solving ability becomes the most crucial link between aspiration and fortune. Coaching for these exams is a multimillion-dollar industry in India, but with almost every student equipped with such preparatory courses, the applicants search for something more. That's why several Indian students are beginning to get help from an ancient source -- Vedic math. It has 16 brief formulas in Sanskrit that have been translated and interpreted into astonishing arithmetic shortcuts. Shetty did not know the original Sanskrit verses, but he did know how to crack the square of 85 in less than a second. "To find the square of any number ending with 5, just put 25 on the right-hand side," he said. "Take the number that precedes five. In this case it is 8. Add 1 to it. So in this case it becomes 9. Multiply 8 and 9. You get 72. 7,225 is the square of 85. It's easy." Shetty is preparing for the prestigious Joint Entrance Exam. Over 150,000 candidates take this entrance exam every year to compete for only about 3,500 seats in the Indian Institute of Technology. Two-thirds of IIT's graduates leave for America, augmenting the thousands already there who contribute to the institute's reputation. American colleges and industry greatly favor students from IIT, a situation that has only increased competition to enter the institute. Pradeep Kumar, who teaches Vedic math in Delhi, said, "There is an increasing interest among IIT aspirants to take the help of Vedic math." Kumar charges such students about $120 for 40 hours of lessons. He teaches more than 200 students in the classroom and guides over 600 through long-distance courses. Not all of his students dream of attending IIT. Several, mostly engineering pupils, are preparing for MBA entrance exams as tough as IIT's. One of Kumar's students, Kartik Arora, said, "Obviously Vedic math cannot teach you how to solve a problem. But it greatly reduces the computing time. I can vouch for the fact that in a two-hour exam, I can save about 10 minutes using Vedic math." 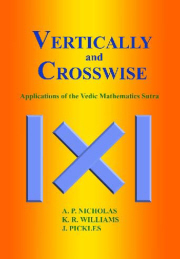 Vedic mathematics was ushered into the modern age by a Hindu seer called Tirthaji Maharaja, after his book on the subject was published posthumously in 1965. He culled 16 formulas from ancient scriptures. Whether the formulas were indeed written centuries ago or were largely partisan interpretations of obscure Sanskrit text is a matter of academic debate. T.A. Ramasubban, who has penned a book on Vedic math, said, "The controversy arises because some people question how a cryptic Sanskrit verse that means several things can be safely interpreted as an arithmetic shortcut. For example, there is a verse in the Vedas (scriptures) that praises Lord Krishna in the Vedas. If the Sanskrit words are interpreted, the verse gives the value of pi to 30 decimal points. "My point is that a verse may extol a god, but ... if it also gives the value of pi to 30 decimals, it cannot be a coincidence or desperate translation." The controversy over whether ancient texts have been unfairly stretched to pass as formulas does not affect students like Prashant Chopra. He is a fourth-year engineering student gearing up for an MBA entrance test to secure a place in the Indian Institute of Management. Last year, more than 130,000 students vied for 1,300 seats. Thanks to Vedic math, Chopra can arrive at the square of 109 in a second -- and that means more to him than whether the subject is indeed Vedic or math. Top preparatory courses that coach hundreds of thousands of students do not teach Vedic math yet. "I know that many of my own students are curious about Vedic math," said Rajesh Lad, a math instructor, "but I believe that learning a new way of computation may confuse students. Students must sharpen methods that they are comfortable with instead of taking exotic routes." Dinesh Arora, a Vedic math teacher whose two sons will be testing for IIT after mastering the tips of Vedic math, said with a chuckle: "These (teachers) do not realize that some of the shortcuts they themselves suggest are indirectly sourced from Vedic math." An introductory course on Vedic Mathematics at the Bharatiya Vidhya Bhavan Manchester, starts on the 18th September 2004 and runs every Saturday from 10.00am-11.00am through until 11th December 2004 with a mid-term break on 30th October. A more advanced class will follow in the second term in January 2005. The cost is 25 pounds per term, with a 10 pounds registration fee for the Bhavan (the registration fee is valid for a year, sept 2004-2005). The venue is Kingsway High School, Foxland Road, Gatley, Manchester. Jain (Australia) who has just spent 5 weeks in Sydney teaching Vedic Maths and Sacred Geometry, and also in the U.S. has been invited as a guest speaker on 24th September 2004 in Brisbane, Australia at the next international Nexus Conference. He will be speaking on Vedic Mathematics and related subjects. Jain is also to write another article on VM for the Nexus Magazine. World Association for Vedic Studies, Inc. India Branch. A Multidisciplinary Academic Society, Tax Exempt in USA. At Kannada Bhavana Auditorium, University of Agricultural Sciences, Bellary Road, Old Campus, Bangalore, India. Abstracts of papers and proposal for holding symposia are invited. The conference is eighth in a series of annual conferences held in India. Previous two conferences have been held at New Delhi (2002) and Pondicherry (2003). WAVES is a USA based academic society open to all scholarly views and for participation of all persons irrespective of their caste, creed and country of origin. The aim of the conference is to exchange ideas and to explore new insights in any field of Indian / Vedic studies in an academic environment. Papers on any aspect of Indian studies are welcome for presentation at the conference. There shall be papers with special focus on Scientific and Technological Information in Vedic Texts, Upanishads, Gita, Ramayana, Smritis and other ancient texts. Submission of Abstracts: Last date -15th November, 2004. (2) Professor C.L.Prabhakar, President, Bangalore Chapter, WAVES. , Ph: 080-26592489 (R). Registration: No registration fee for life members. For yearly members-Rs300/-, for students -Rs250/-, and for others - Rs. 500/- per person. Send your registration fee through a bank-draft in the name of 'World Association for Vedic Studies' on a bank payable in Delhi (or through cheque including Rs. 40 for collection), to Dr. Shashi Tiwari, address as above. Accommodation: Last Date for room booking-15Nov, 2004. Persons interested in staying near the conference venue may get rooms on Uni. Campus on reasonable rates. Please contact local organizing committee Chairman, Prof. C L Prabhakar mentioning the dates of your stay. Join educators from all over North America, contribute to the betterment of curricula and resources on Indian heritage and make a difference in the educational system in America. Organized by the Educators' Society for the Heritage of India (ESHI), your non-profit support organization to educate the world about India. Sponsored by Hindu Students Council, Rutgers University. Seminars, discussions, and workshops on issues related to the education of Indian Heritage, including Culture, Religion, Arts and History from k-12 through college, in US and Canada. Cultural program by Rutgers students on Friday and Saturday evenings. This program is intended to bring together college professors, teachers (K-12), librarians, curriculum writers, special program developers and textbook publishers, as well as students, parents/community members interested about Indian heritage, from US and Canada . This is a program for those who are interested in actively engaging in and contributing to the enhancement of resources for students and educators K-12 through college. It is not a program to submit papers for scholarly publications. World Academy of Vedic Maths took the initiative and decided to conduct the VM workshop in Ahmedabad, which has been academically inclined from the beginning. The event would not have been possible without the invaluable support of L. D. Institute of Indology in terms of venue as well as publicity for the event. The press conference was called and one workshop was announced for 3 days : 9 -11 August 2004. We were expecting 60-80 participants as the capacity of the hall was 100 participants. Unfortunately there were unprecedented rains in the city and we were able to get only 19 registrations till Saturday. The workshop was going to start from Monday evening and our hopes were dismal with heavy flooding in the city and many roads blocked with water. We were wondering if the people who had already registered would be able to make it till the venue. However there was magical Sunday in between, which changed everything. One of the local newspapers carried a small news item about VM, which mentioned the venue and the time of workshop. Since Sunday was a holiday, most of the readers saw the article. That was the beginning of new record in the history of Vedic Maths. Within next three days there were more than 3000 registrations. The registrations are still flowing in as I am writing this article. People came from all walks of life. The administration staff at L. D. Institute of Indology was completely baffled. It was as if people were waiting for this event. This means that even if we take back to back workshops for next three months continuously, we will not be able to cover all the participants. This was heartwarming as well as encouraging. However it was difficult to manage so many people. Apart from the first workshop, 4 more workshops are already announced. The first two workshops are already over. Manish Soni from Baroda along with the husband and wife team of Trupti & Ashutosh Rawal from Ahmedabad have won the hearts of all the participants. They were magical and people could not have enough of them. On the last day of second workshop, people were not ready to go home. They wanted more. The workshop was extended for almost an hour to satisfy the queries of participants. The hall was packed with 210 participants, some of whom were sitting on the floor as well as standing on the sides. There was an all round participation from various segments of society. The participants were ranging from school children to housewives and from chartered accountants to doctors. There were a lot of maths teachers from various educational institutes, who also benefited from this workshop. The saga continues and Manish Soni along with Ashutosh Rawal have been successful in hypnotizing the crowds with their magic of numbers and amazingly simple mental calculations. We look forward to many more workshops like these and support from the people who value our heritage and ancient wisdom. Greetings from Spain. I have published an essay in the web with the title "Samkhya and Golden Mean", with later commentaries with the epigraph "Explanations, questions and answers". The page is in the web address www.hurqualya.com . English is not my mother language, therefore the translation is not very good. The essay is a study of the connections between the Samkhya concept of fluctuation, ayurvedic pulsology -nadi vigyan- and the asymmetric and algorithmic theory of measurement proposed by A. S. Stakhov, an Ukrainian mathematician. I am trying to research deeper in this question. This could be very important for the re-evaluation of the Indian heritage and culture, that I love so much. By the way, do you know if Vedic Mathematics treated on the phi number and the so called golden section? An article "The Sutras of Vedic Mathematics" by Kenneth Williams has been published by the Journal of Oriental Studies, Golden Jubilee Issue, Vol. L, September 2000-June 2001 (published April 2004). ISSN 0030-5324. Registered Address: Vishwa Punarnirman Sangh, Raval Bhawan, Near Telankhedi Garden, Nagpur-440 001, India. 91(011) 2385-2747 / 2385-4826 / 2385-8335 / 2385-1985. Your comments about this Newsletter are invited. Issue 2: "So What's so Special about Vedic Mathematics?" Issue 11: Is Knowledge Essentially Simple? Issue 31: Why Vedic Mathematics? Please pass a copy of this Newsletter on (unedited) to anyone you think may be interested.